When our clients talk, we listen! And when they, along with our own employees, have the highest praise for one individual we are more than happy to honor her with the “We Are Harris” award. 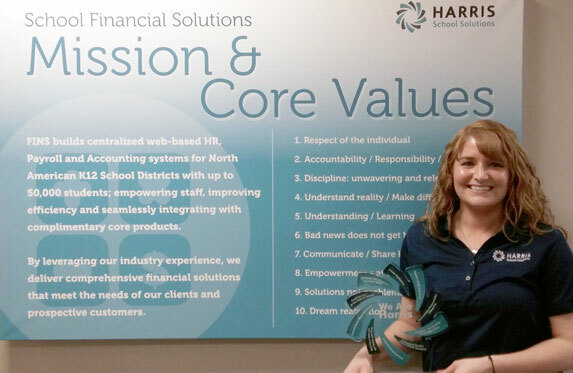 Please join me in recognizing Holly Muhs for being an indispensable resource to the Harris School Financial Solutions team. Harris operates under 10 Core Values. Empowerment at the Point of Contact is one value that stands out for Holly. She knows that after a site implementation there are multiple documentation and training projects that need to be customized for each district. Holly works to empower supervisors and payroll staff with these tools from the onset to ensure a smooth transition and a successful project. She is motivated by the fact that the clients trust her and think to call her to help solve the hardest problems in their jobs; she knows that they value her opinion and reach out to tap into her in-depth product knowledge. For this reason, she has established a strong rapport with many clients over the years. Holly began her tenure with Harris when Capital Computers Associates was acquired in 2012; she has been with Harris four years. As a Software Specialist who also performs Professional Services duties, she implements and supports the WinCapWEB Timesheets, Employee Self Service and Payroll Voucher modules as well as supporting the day-to-day support needs for WinCap and WinCapWEB payroll and human resource users for Harris School Financial Solutions. When not helping clients and laughing with colleagues, Holly loves to spend quality time with her family. The mother of two children, Andrew, 3 and Madison 1, devotes her free moments to keeping them busy and their minds developing with arts and crafts and other activities. She and Adam, her husband, feel like they experience a new adventure every day as they watch their family grow.